A tasty twist on classic meatballs that's sure to please a crowd. The flavor is similar to that of an Asian dumpling filling—the perfect amalgamation of salt, spice, and aromatics. Ground turkey is combined with a savory mix of chopped scallions, garlic, ginger, soy sauce, sriracha, and fish sauce. Rolled oats sub in for breadcrumbs, and add texture and a faintly nutty flavor. Serve these savory meatballs as a main course, or form into tablespoon-sized meatballs and skewer with toothpicks for a delicious party appetizer. Serve with extra soy sauce and sriracha if desired. These meatballs are perfect on top of a bed of simply dressed greens, or steamed rice or quinoa. To make them paleo, substitute almond flour for the oats. The meatballs can be prepared ahead, and will keep well in the refrigerator for up to three days. Per Serving: 757 calories; 45g fat; 20.9g carbohydrates; 66g protein; 380mg cholesterol; 867mg sodium. I've been on a meatball kick lately, and I really love the flavor of these. I added this to some leftover kimchi fried rice I had. Was very pleased with these and will definitely make again. Mine fell a little flat while baking them. The flavor was solid though, they just didn't quite look like meatballs. Next time I make them I'll add more oats to the recipe to fluff them up. I did the almond flour substitute, worked like a charm. I also used ginger paste instead of fresh grated ginger, could not tell the difference. Such an easy meatball recipe! 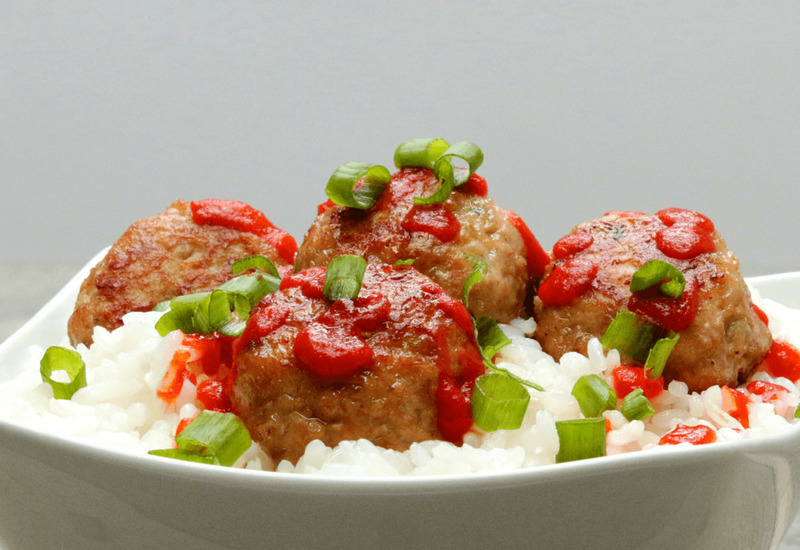 I used ground chicken for these meatballs and they were really yummy! I served them on a bed of greens (arugula and baby spinach), it worked nicely.